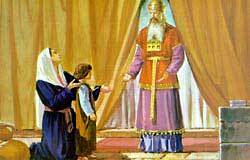 Hannah dedicates Samuel to the Lord and brings him to Eli at the Temple. IFTEEN JUDGES RULED the people of Israel during a period of four hundred and fifty years; that is, from the death of Joshua, till Saul was chosen as their first king. Samuel was the last of these judges; and he was a priest and a great prophet, as well as a ruler of the people. His father and mother were named Elkanah and Hannah. They were very good people, and year by year went up from the place where they lived to Shiloh, where the Tabernacle had been set up, to worship and offer sacrifice to God. This all the Israelites were obliged to do after they were settled in the promised land. Hannah had no children; and as she was grieved that she had none, she prayed to God, when worshiping at Shiloh, to giver her a son, promising that if He would, she would dedicate him (that is, give him up) to the Lord God, in the service of the Tabernacle, from his childhood. God granted her request; and when the child was born she called him Samuel (which means "Asked of God"), because he had been given to her in answer to her prayer. The first time after his birth that Elkanah and his family went up, as usual, to worship at Shiloh, Hannah did not go with them. She told her husband should not do so till Samuel was weaned, and then she would take him with her, and leave him with the priests, who might train him to serve God in the Tabernacle. Elkanah bade her do as she thought best in the matter. So when Samuel was weaned, she took him with her to Shiloh. And when she had offered sacrifice to God, she told Eli the high-priest, who was also at that time judge in Israel, that she was the woman whom some time before he had seen praying in the Temple (as the Tabernacle was also called), and that Samuel was the child she had prayed for. And now, as she had promised, she was come to give him to God, that he might be His priest. Then, when Eli had given his blessing to Hannah and her husband, they returned home, leaving Samuel with him. And the child served in the ministry of the Temple, clad in a white linen garment that the priests wore. It was called an ephod. And every year that his mother came up to worship at Shiloh, she brought him a little coat, that she had herself made for him. And as Samuel grew, God blessed him; and Eli, who was very old and nearly blind, was fond of this good little child whom everybody loved because he was good.